We’re delighted to be working with I’m With her – aka. Sara Watkins, Sarah Jarosz and Aoife O’Donovan – for the first time! 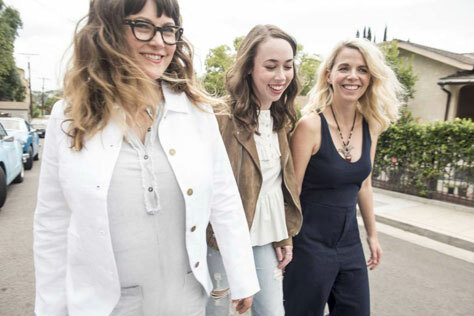 I’m With Her are Sara Watkins, Sarah Jarosz and Aoife O’Donovan. From their early contributions in bands such as Nickel Creek and Crooked Still, these three musicians are noteworthy for their recent and extensive solo career successes, including several Grammy awards. An impromptu show in 2014 at the Sheridan Opera House in Telluride, CO, sparked the formation of I’m With Her and sent the trio touring the world together the next year. Along the way, I’m With Her formed a special, family-like chemistry, garnering acclaim for their unique blend of instrumental interplay combined with their indelible harmonies, as the New York Times describes, ‘that could be sweetly ethereal, or as tightly in tandem as country sibling teams like the Everly Brothers, or as hearty as mountain gospel’. Their debut album, See You Around, was recorded in Bath, England, with Ethan Johns at Real World Studios and is released in February 2018. This standing show is a co-promotion with Band on the Wall. This is a 14+ show. Under 16s must be accompanied by an adult. Buy tickets now. Tickets are available from Band on the Wall’s box office (no booking fee), Piccadilly Records, Vinyl Exchange, Seetickets.com and on 0871 220 0260.